Review copy snagged out of the box sent by our Hachette rep. Content: There’s lots of ghosts, obviously, and some scary situations. Also a couple of deaths and a couple of instances of mild swearing. It’s in the middle grade (grades 3-5) section of the bookstore, but I’d be wary about giving it to an overly sensitive child. It’s not very often, I think, that the second book in a series is as good (if not better) than the first one. This is one of those rare instances. First off, it was wonderful to be back with Lockwood, George, and Lucy. 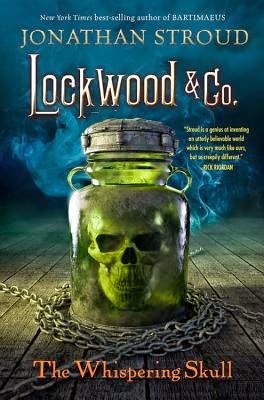 Lockwood was as reckless and charming as ever; Lucy was still the glue that held the company together. But George was really the focus of this story. He got his moment in the spotlight, and was something more than the bookish, slightly overweight Other Guy. The mystery this time is centered around a body Lockwood, Lucy, and George are hired to help secure. A couple of grave excavators have found a grave site that wasn’t supposed to be there, the body of one Edmund Bickerstaff, who was a leading paranormal and psychic experimenter in Victorian times. It turns out that he was experimenting with things he shouldn’t have been, creating a Bone Glass which was supposed to give you a view into the afterlife, but instead kills anyone who looks at it. Soon after the excavation, however, the Bone Glass is stolen, and Lockwood & Co are in a fierce competition with their rivals at Fittes to solve the mystery. Oh, and yes, the whispering skull of the title (and the cover; love it!) does play a fairly major role. There are so many brilliant things about this book. From the pacing (I couldn’t put it down!) to the hilarious asides, to the action-adventure feel. It’s wonderful that you don’t really have to read The Screaming Staircase to enjoy this one. There are a few references to the previous book, but nothing happened in it that you Have to know before picking this one up. Additionally, even though there are teasers for the next book (which can’t come out soon enough) the story in this one wraps completely up. I love it when series books are like this. I'm jealous. But it's ordered and we'll wait for it to appear on our Kindles in a couple of weeks. So excited to read this one, I've ordered it and have it on my list of books to read in October. And Yeah, no cliffhanger, but leaves you wanting to read more. Loved both books. Have long been a Stroud fan, but he's really outdone himself with this. I want to be the office manager at Lockwood and Co.! I really liked the humorous asides in this one. I felt that was one area in which it was actually stronger than the previous book.